Anera B.V. was founded in 1987. Due to being active in the logistics market for a long time, we have gained a lot of knowledge and experience in the storage industry. In 1997 we started with coating of our components by ourselves and since 2007 we have our own profile rolling line. We are also active outside the Dutch borders since 2000. Anera B.V. started as a small trade organization for mezzanine floors, pallet and shelving. Later Anera has specialized in the sale, supply and installation of mezzanine floors with related products. 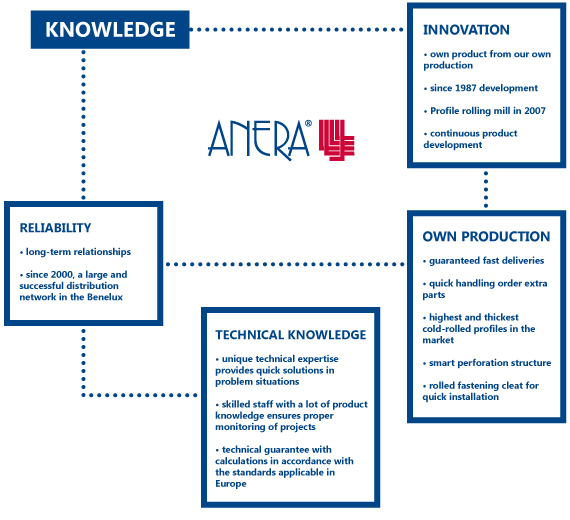 Anera B.V. is one of the few producers of mezzanine floors in Europe with its own uniquely designed construction system based on our Euro-profile. Because we manufacture our entire product itself and we are not dependent on suppliers, we can offer the best quality, reliable delivery and fast support. To make this possible, we have an office with well-trained engineers, a construction workshop for the production of welded parts, a rolling mill for rolling our profiles and a paint shop to powder coat the parts. Total production into their own hands. Over 800 mezzanine floors annually. Since 1987 experience resulted from a unique product and market knowledge. Solid sales network throughout Western Europe and Poland.